What's New: A new (more compact) installer. 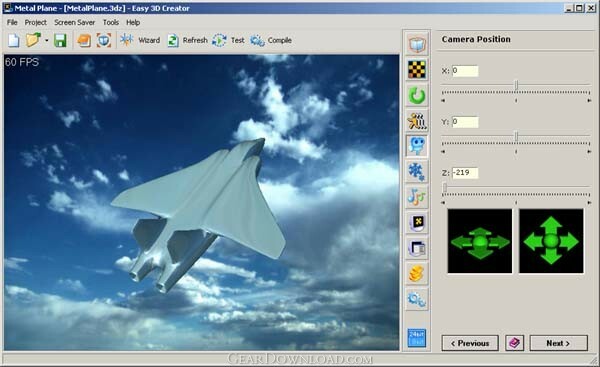 This download (easy3dcreator3002i.exe) was tested thoroughly and was found 100% clean. Click "Report Spyware" link on the top if you found this software contains any form of malware, including but not limited to: spyware, viruses, trojans and backdoors. WAV Splitter 1.3.7.7 - WAV Splitter is an easy-to-use tool for splitting a WAV file into smaller ones. AC3 Splitter 1.1.8.1 - It is an easy-to-use tool for splitting an AC3 file into smaller ones. freeTunes 3.0 3.0.12.309 - Legally copy all your DRM protected music! Direct MP3 Splitter and Joiner 3.0 - Join, combine, split or cut mp3 and wav sound files easily. ALO Video Converter 8.0.100 - Convert Video files to AVI, MPG, WMV, RM, MP4, 3GP, FLV format. TS-AudioToMIDI 3.30 - TS-AudioToMIDI creates MIDI sequences from WAV/MP3/CD tracks, also in realtime. Visual Hindsight Video Joiner 1.2 - Video Joiner is an easy to use multimedia collating utility.